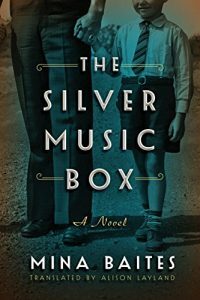 For a historical novel purportedly attempting to tell an intergenerational, transnational tale of the fortunes of a German Jewish family torn apart by the two world wars and the Holocaust, The Silver Music Box by Mina Baites, it must be admitted at the outset, disappoints sorely. Its hold on the lived reality of the many decades separating these catastrophic events is slender and tenuous; it is disconcerting to find that the writer of a novel detailing the Holocaust jettisons any attempt to look with depth and complexity into these events and the horrific impact they had on individual lives. The Author’s Note at the end suggests that one of the important intentions in writing the novel was to clarify the misconception that only Christian German soldiers fought in the First World War. In fact, as Baites asserts, there were one hundred thousand Jewish soldiers who fought bravely for their country, amongst whom around twelve thousand were killed in action. Quite obviously they had no inkling of the insanity that would be unleashed within a few years after the completion of the war. While Baites lists her historical sources, and the reader should have no quarrel with her accuracy in the presentation of facts, it is the breezy and simplistic conjuring of the characters’ lives, their emotions, thoughts and consciousness in which the author is insufficiently invested that jarred this reviewer. As the title suggests, it is a family heirloom that connects members of the different generations of the Blumenthal family scattered across two continents which the novel attempts to portray. In 1914, Johann Blumenthal, a Jewish silversmith of Hamburg, crafts his most exquisite creation after signing up to fight for his country: an ornamental silver box with a singing filigree bird inside, as a parting gift for his four-year old son Paul. Half a century later a Londoner Lilian Morrison inherits the box after the death of her parents. With this keepsake, along with a letter and some papers, Lilian comes to know that she was adopted. In more than half the novel, Baites employs a straightforward omniscient narrative that tells the story of Johann and his struggles on the war front; his son Paul growing to adulthood during the years that Hitler rose to power, the incremental terrors experienced by him, his extended family and the Jewish population as a whole. This narrative terminates abruptly just around the years leading up to the Second World War, switching to the story of Lilian in the London of the 60s. Her search for her roots therefore fills in the gaps uncovering a trial leading to her troubled and violent past, finally connecting to her single living parent in South Africa. As a narrative strategy this is ingenuous, allowing the backtracking of events from another character’s perspective, making room for a suspenseful build up towards the possibility of a climax. Within the demands of a bestselling novel, which this one certainly hopes to be, one understands there will be what is termed as a ‘happy ending’. However, given the framework of the story, it elides completely the depiction of the desperate horrors of the Holocaust. Secondly the novel’s brittle and vacuous writing (even allowing for the fact that as a translation some loss is part of the enterprise) is hardly the medium for the capture of sensitive, insightful representation. Primo Levi has spoken of the special responsibility that rests on those who write of the Holocaust: this English translation of the novel is innocent of the enormity of that onus. For the present reviewer there were, despite its marked flaws, two takeaways from this work. One is the political situation in contemporary Israel where the state is flexing its muscles over the Nationality Bill that may effectively render its population of Arab Muslims stateless. For a people who have suffered so much, the Jews may soon become the perpetrators of a ghastly law that reduces the status of Arab Muslim minorities within Israel further; the possible enactment of this legislation is therefore historically and morally incomprehensible. The second is the contemporary situation in India: the climate of hate and fear in the Germany of the 1930s which the novel attempts to evoke complete with its lynch mobs, looks uncannily like the fear that stalks minorities and Dalits, and indeed all right-minded Indians across the country today. These are the only reasons why Baites’s novel may be worth a read. Rohini Mokashi-Punekar is Professor at the Department of Humanities and Social Sciences, Indian Institute of Technology Guwahati. She is the author of On the Threshold: Songs of Chokhamela (Altamira Press 2005 and The Book Review Literary Trust 2002), Untouchable Saints: An Indian Phenomenon (Manohar 2005) co-edited with Eleanor Zelliot, and Vikram Seth: an Introduction (Cambridge University Press 2008). She is currently engaged in translating medieval Varkari poetry from Marathi, an anthology of which will be published by Penguin in their Black Classics series and Jotirao Phule’s play Tritiya Ratna to be published by Orient BlackSwan.